Double potency, more concentrated and twice the size! 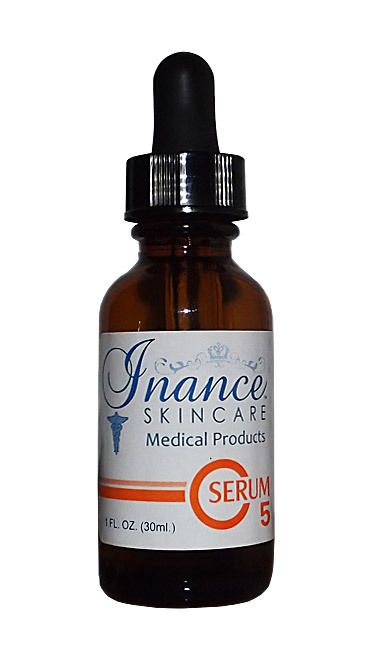 !Inance Vitamin C Serum 5% is a potent antioxidant, designed to help minimize the damaging effects of free oxygen radicals. It’s an excellent product for people with sensitive skin, even teens. Vitamin C increases collagen as well as mRNA for Type I collagen and Type III collagen expression in human skin fibroblasts. Vitamin C, also known as L-Ascorbic Acid, is a water-soluble biological reducing agent. Synthesized by most animals except for humans and a few other animals, we therefore, must obtain it through diet or other means. It also exists in the D conformation; however, the L conformation is considered the form most beneficial to the human body. It exists as a white crystalline powder or a clear aqueous solution. Vitamin C is relatively unstable and oxidizes in the presence of air or other oxidizing agents. The oxidized form is biologically inactive and can be identified if the solution is yellow or yellowish-brown. Vitamin C has been shown to help protect against the harmful UVA and UVB rays of the sun by neutralizing the reactive oxygen free radicals (superoxide anion, singlet oxygen, hydroxyl radical, etc.) that are responsible for photoaging and for the destruction of dermal and epidermal connective tissues. If left unchecked, the free radicals are capable of mutating cells and destroying elastin and collagen thereby reducing the skins elasticity and texture. The role of Vitamin C in assisting with the formation of collagen and elastin has been documented in scientific and clinical publications. The results of using Vitamin C in prescribed regimens and in conjunction with a broad-spectrum sun protection product has shown a reduction in the appearance of fine lines and wrinkles and increases in hydration. The serum is sold in a 1 oz. glass amber bottle. Apply 2 to 3 drops of the serum to desired area and then massage with fingertips. Serum may appear cloudy if cold due to precipitation. Warm the bottle in your hands or run under lukewarm water to re-suspend the precipitates. Propylene Glycol, Ethoxydiglycol, Ascorbic Acid, Ceteth –20, Diglycerin, Fragrance.